If you were 10 years of age or older back in the mid-1990s, you probably remember the first batch of Virtual Reality devices that hit the market. They were only available to the super-rich or those in academia. Our only glimpse of VR technology was in movies such as The Lawnmower Man. The sad reality of virtual reality, in that era, was that the technology to create truly immersive virtual worlds just wasn't available. The only access kids had to virtual reality at that time was the terrible Nintendo Virtual Boy that could only display red and black and gave a lot of people headaches. Back then, VR was, at best, a passing fad and one that most kids never even got to experience. Fast forward to the present. Over the last year or so, VR has made a huge comeback, and kids of this generation will likely have a much better chance to experience it thanks to VR going mainstream with products like Samsung’s Gear VR, Sony’s PlayStation VR, and other head-mounted VR displays such as those from HTC and Oculus. The great thing about PlayStation VR is that you can use it for other things besides virtual reality games, too. This is a living list that will be updated frequently as new games are released that displace the currently ranked titles. Another staple of every vacation is a trip to an old-timey arcade. You know, the one with Skee-Ball and those quarter sucking prize claw crane games. Sure, you always felt like those things were rigged so that no one could win, but you kept playing because you really wanted that stuffed bear that was always slightly out of reach. What if you could have your own private virtual arcade complete with Skee-Ball, Whack-a-Mole, the claw machine, and all the other classics? Well, good news, you can with Pierhead Arcade. Peirhead Arcade has all the classics you pumped hundreds of quarters into, and it even gives you virtual prize redemption tickets so you can choose your prize at the prize counter. You can almost smell the corn dogs. Why it’s fun for kids: Who wouldn’t want their own private, rigged claw machine that they could practice on all the time? Let’s face it, most VR shooters aren’t for kids. There are some great shooting-gallery-type games for VR, but most of them are too scary for kids and involve killing zombies, monsters, or people. They definitely aren’t kid-friendly. Candy Kingdom VR takes the on-rails shooter and makes it something that is friendly and accessible for kids. Yes, you’re still shooting at things, but it doesn’t really feel like a violent game. It feels more like a whimsical Disney ride or a wholesome carnival game. The game is colorful, bright, and surprisingly challenging. It’s candy world theme probably won’t induce nightmares like all the currently popular zombie shooters might. Why it’s fun for kids: Bright colors, fun action, and candy of course. Who doesn’t like candy? Remember when you got your first computer and you opened the paint program that came built into the operating system? You spent at least an hour or two trying out different brushes, colors, stamps, and blending tools. You were in awe of it because it was a completely new medium that you had never used before. Tilt Brush takes that same experience of exploring an entirely new medium and brings it to a new generation of kids (and their parents as well). Tilt Brush is essentially a 3D VR paint program that allows you to create drawings in three-dimensional space. You can draw things that have depth, and then you can scale them up or down, walk around them, erase them, or change them—whatever you can imagine. You don’t have to use traditional brushes, either. You can paint with fire, smoke, neon light tubes, electricity, or whatever your heart desires. There are so many possibilities that you can lose yourself in Tilt Brush for hours. The controls are intuitive and become second nature within a couple of minutes of use. Once you know the controls, then it’s all just raw creativity. Why it’s fun for kids: It’s an entirely new medium that they’ve never explored before. Remember going on family vacations when you were a kid and ending up at a miniature golf course? They always had some cheesy pirate or dinosaur theme to them, but you were a kid and you loved that stuff, so it was awesome. Cloudlands VR Minigolf attempts to distill that “putt-putt” experience and bring it into the VR world, and they have done a pretty great job of making it into an immersive experience. Cloudlands is bright and colorful and the controls are easy to use. That doesn’t mean it’s easy to play though. This game can be just as frustrating as mini golf is in the real world, but, ​honestly, that frustration is what makes it challenging and fun for all ages. The included courses are both fun and challenging, but the real replay value comes from the game’s “course creation mode.” Yes, that’s right, you can design and play your very own mini-golf courses, and you don’t even have to tear up your parents’ backyard to do it! You can even share your course with the world when you’ve finished making your masterpiece. You can play courses created by other users as well. Why it's fun for kids: It's fun, easy to play, and you can make and play your own mini golf courses! Smashbox Arena is part multiplayer dodgeball and part first-person shooter. This game is definitely dodgeball on steroids. There are different kinds of game balls, from homing missile-type balls to balls that change into giant rolling boulders that can be used to crush enemies. You can even obtain a sniper-rifle-type dodgeball shooter for accurate, long-range shots. Multiple arenas and game modes make for all kinds of fun. If this game’s popularity holds up, there will always be someone available to play against. If no human players are available, you can still play bot matches against AI opponents. Even though this is basically a multiplayer first-person shooter, it’s essentially still just dodgeball, so there isn’t blood and guts involved, which keeps the play kid-friendly. Why it’s fun for kids: Everyone loves dodgeball… and missiles. Rec Room is a social VR playground. It lets users join together and play games such as paintball, Frisbee golf, charades, and dodgeball in a social setting. As with anything social, you will encounter good people and not-so-good people. Overall, it seems to be a pretty safe and fun environment to explore. In Rec Room, you start off in your own private “Dorm Room” where you design and outfit your in-game avatar. You pick clothing, gender, hairstyle, and accessories. Once properly outfitted, you move to the common area known as the “Locker Room” where you get comfortable with the controls, meet up with other players, and decide what games you want to play. You can enter and exit a game whenever you want and are brought back to the locker room area. Rec Room is fun for all ages but the developers recently decided to limit access to only those 13 years of age and up. Why it’s fun for kids: Multiplayer VR paintball! Fantastic Contraption is an inventive game in which you create “contraptions” (simple machines) to navigate obstacles in each level of the game. You build these simple machines out of balloon-animal-like parts that you get from a cat. Once you’ve created and assembled your machine, you test it to see if it will perform its intended function so that you can complete the level. If it fails, you make changes to it and try it again. The game requires a lot of trial and error. Fantastic Contraption is a blast because it requires creativity and problem-solving. You get some basic parts (axles, wheels, etc. ), and it’s up to you to build something that will work and allow you to go to the next level. It’s a very STEM-inspired game. Why it’s fun for kids: They get to build stuff and test their inventions. What could be more fun than that? Valve Software’s The Lab is a collection of mini-games and VR experiences intended to introduce users to the world of VR and whet their appetites for future VR experiences. The Lab is set in Valve’s Portal universe and has a lot of science-experiment-gone-wrong humor in it. Longbow: Longbow is basically a Tower defense mini-game in which you defend your castle from invading stick people by shooting them with arrows. The waves get progressively harder as time goes on. Once too many invaders reach the castle door and break it open, the game ends. Slingshot: In the Slingshot mini-game, you control an industrial-strength catapult and use it to shoot “calibration cores” (which are pretty much-talking bowling balls) at boxes in a giant warehouse. Your goal is to do as much damage as possible. The “cores” taunt you and plead with you as you launch them from the catapult. There are several other mini-games and experiences within The Lab, but the above two are the ones that kids seem to gravitate towards the most. Why it’s fun for kids: The mini-games are great fun and you get to be a scientist, which is cool. There is also a little robot dog that runs around. He likes to play fetch, and if you’re really nice to him, he’ll let you scratch his belly. VR The Diner Duo is a unique title in that it allows for cooperative two-player play. So you’re probably wondering, how can two people play a game with only one VR headset? In VR The Diner Duo, one player plays as a short order cook using the VR headset, and the other player sits at the computer looking at the monitor while using the keyboard and mouse to control a waiter/server. The player at the computer takes the orders, tells the cook what the orders are, prepares beverages, and picks up and serves food to the guests. The cook in VR cooks and prepares the food and places it on the service counter for the server to take to the patrons. Both jobs get pretty hectic after about level 10. The difficulty increases as progressively complicated menu items are added and the number of diners increases. If you take too long with someone’s order, he or she gets mad and doesn’t pay as much for the meal, which results in fewer points. If the customer gets really mad, he ends up leaving. If three customers walk out during a level without getting their meals in a timely manner, it’s game over and you must start the level again. Honestly, this was one of the most fun and stressful kids’ VR games we’ve played. You really feel like you’ve been at a hectic job after playing this for 30 minutes, but kids seem to love this game, and the co-op mode makes it a great party game. Why it’s fun for kids: Kids love cooking. Pretending to run their own restaurant is something that most kids both young and old have always enjoyed doing. One of the first polished VR experiences available on the market was Owlchemy Labs’ Job Simulator. The year is 2050, and robots have assumed all human jobs. This game provides a nostalgic experience by letting humans see what it was like to work for a living. The game lets you select any one of four different jobs. You can become a convenience store clerk, an office worker, a mechanic, or a gourmet chef. You are led through each job simulation by a job simulator instructor bot who explains the tasks at hand. The game is filled with dry humor and off-the-wall situations that are funny no matter what age you happen to be. Both adults and kids will enjoy this game. Why it’s fun for kids: Kids like to pretend to be adults. This game makes it fun to try “adult jobs,” and kids don’t have to worry about screwing anything up. It’s also just downright hilarious. VR really is a whole new world and this is just the first wave of content. 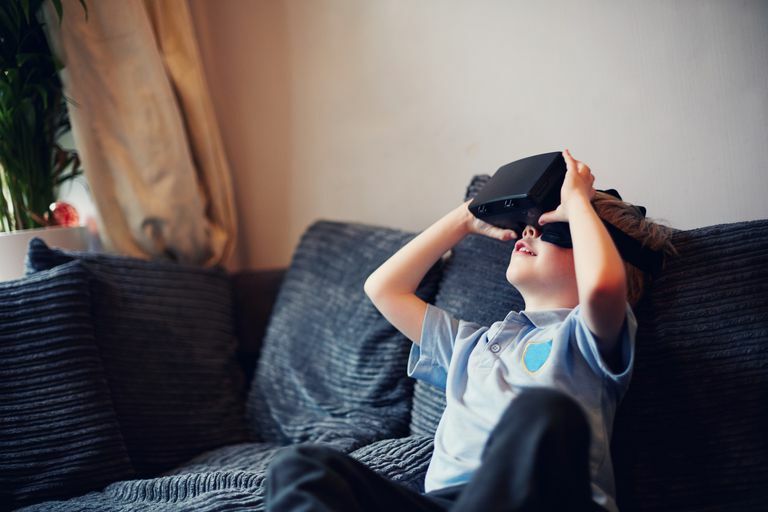 The possibilities for both fun and educational games for kids are endless and only limited by the imaginations of VR developers.